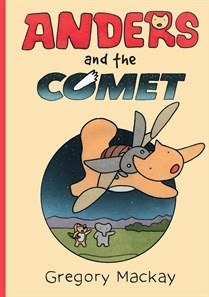 Anders and the Comet is a graphic novel suitable for kids 6 - 9. It was created by Gregory Mackay and published by Allen and Unwin, 2015. Meet Anders, Eden and their new friend, Bernie. It's the school holidays, and there are comics to be made, games to be played, ice-cream to be eaten, and rhinos to impress at Wekiwa water park. Then Anders and his friends meet the Green Grabber and things take on a whole new twist, leading Anders to a wonderful pet, Skip, and to wild adventures - and a dramatic rescue - in the sky. An endearing story of fun, friendship and unexpected courage. This is an interesting concept. A black and white comic format brings us the story of Anders’ life - school, holiday fun, a new friend who was bullied at his last school, family interactions… and the mysterious Green Grabber! While I’m mostly used to graphic novels being in full colour, the black and white presentation had a gentle retro charm to it. At first I was surprised by the amount of detail in the book. The start was slow because of this as we read lots of dialogue - realistic, but not contributing much to the story. And yet that very slowness is ideal for beginning readers. They have time to get to know the characters and the setting, and are given lots of opportunities for repetition, to consolidate word decoding. The familiarity of the settings - home, school, the neighbourhood - and much of the action will help kids predict what the text is about. I think under tens who are not yet convinced they love to read will grab Anders and the Comet. It’s not a daunting read - there aren’t lots of words in dense paragraphs. Instead they’ll find dialogue in speech bubbles and hundreds of illustrations, each in its own panel. The story itself is unusually-told, but gentle and lots of the adventures will be familiar to youngsters - building cubbies, playing with bows and arrows, making breakfast, interactions with families, while others not so much - gyrocopters, comets, escaping bouncy castles and flying with the aid of beetles! NOTE: Librarians should be aware that there is a word - beginning with f and referring to a by-product of the digestive system - in the book. It will make kids laugh the way it has since time began no doubt, but there may be parents who will take exception to it. I thought it was totally appropriate because this is the way kids actually talk! Discover more about Anders and the Comet in the video below.